My sister-in-law teaches guitar, so I knew I had to buy this stamp set! This will be her birthday card. I haven't played for years but while watercolouring, I tried to remember what my guitar used to look like! I cut some Basic Black cardstock to 11" x 5.5" and folded it in half to form a 5.5" square card. I layered this with Mint Macaron and more Basic Black cardstock. I then added a 2" strip of Mint Macaron paper from the 2015-2017 In Colour DSP Stack and a 3.5" x 3" piece of Delightful Dijon cardstock. My painted panel is layered onto a piece of Soft Suede cardstock before adhering it to the front of the card with Dimensionals. The last step was to add the banner. I stamped the banner from Number of Years in Basic Black onto Whisper White cardstock and added the greeting from Birthday Banners before cutting it out with the matching die from the Large Numbers Framelits. I inked the edges first with Crushed Curry ink and then Delightful Dijon. For the painted panel: I first stamped the guitar from Country Livin' in Basic Black onto Whisper White cardstock and covered it with a mask that I had prepared. I then used Mint Macaron Ink (stamped off) to stamp the stripes from the Hostest set Basket For You. I added a light coat of Mint Macaron sponging over the stripes before I removed the mask. I then watercoloured the guitar and foreground with Crumb Cake, Soft Suede Tip Top Taupe and Crushed Curry ink. 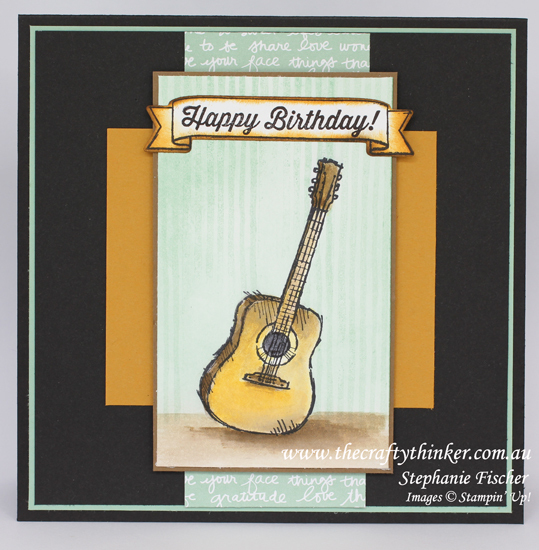 The layout for this card was inspired byMary Fish's version of a Pals Paper Arts Sketch Challenge for May (PPA300).